that are sure to bring a smile to your face! Bhutan, an Asian nation in the Himalayan Mountains, issued a group of postage stamps that were actually phonograph records. These stamps, issued in 1973, had native folk songs recorded on one side and could be played on a record player. Products were advertised on the back of stamps? Sometime before 1883 advertising for various products was printed on the back of U.S. three-cent stamps. Candles were once used to determine the postage rates? In 1693, letters were held in front of a candle to determine the postage rate. The less the light shone through, the more costly the rate. This was known as candling. An undersea post office actually did exist! It was established in 1939 as part of a scientific facility on the sea bed off the Bahamas. They used a special oval postmark that was inscribed "SEA FLOOR/BAHAMAS". Here you can see the post office depicted on Bahamas 5 shilling stamp issued in 1965. A stamp was created on the Moon! In 1969 during the Apollo 11 moon flight, the astronauts took with them a die of a postage stamp which they pulled an impression of when they touched down on the moon. Thus, creating the moon's first postage stamp! Once the die was returned to earth it was used to produce the 10 cent airmail stamp issued in September of 1969. The world's largest and smallest post offices are located in the US! The world's largest post office is the head post office in Chicago, Illinois. The smallest post office in the world is located in Ochopee, Florida. Can you believe Cats were used to deliver the mail! I've heard of many different types of animals being used to deliver mail - camels, reindeer, horses, dogs, pigeons, but CATS? Well it's true. In 1879 Liege, Belgium employed 37 cats to carry bundles of letters to villages. This service didn't last long as cats proved to be thoroughly undisciplined. Great Britain is the only country which issues stamps without its name printed on them. Instead the profile of the monarch appears on British stamps. The Universal Postal Union allows this because Britain was the first country to issue stamps. The first post offices in America were bags hung in taverns. The mail was handled by captains of ships. When stamps were first issued, they had no gum on the back. And if paste was not available, mailers sometimes pinned or even sewed stamps to envelopes. 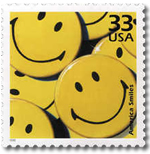 The first touch of humor did not appear on a U.S. stamp until 1963. The 5-cent City Mail delivery stamp was issued for the 100th anniversary of free city mail delivery. The design, by Norman Rockwell, featured a letter carrier holding an umbrella, followed by a smiling boy and a little dog. © 2018, American Philatelic Society. All Rights Reserved.